I never would have expected that to change. Sometime in September, during a seminar, I spoke up and talked to my classmates about the importance of self-care and self-esteem. It just came out of me, and from a place of inspiration and passion. I did surprisingly well. It affected people deeply. I was thanked for that speech even months afterward. Somehow, that one seminar changed me. I began giving more speeches. I became more vocal about things that matter to me. When giving presentations, I put my own personal spin on things. That one seminar gave me confidence. Yes, I am a writer. Most of the time, I’d rather reflect on what I say before saying it. But I can finally also say that yes, I’m a speaker. I’m able to think as I’m talking now. I can “wing it” when I need to. Public speaking fills me with life. It fills me with life because I know that I’m inspiring people. I’m strengthened and empowered. I take every opportunity I can to do this. I find a balance, really, in preparation. I work best when I have some points jotted down. If for nothing else, it helps focus me and make me feel secure. I have to feel confident about what I’m speaking about, and that I know when I’m about to speak. I need to feel that I’m in a safe environment. When those criteria are not met, I despise being the center of attention and will avoid it at all costs. The other day in geometry, I had to present a problem in front of the class. Geometry, obviously, is not something I feel comfortable talking about in front of others (or ever). It takes me time to open up in a new environment, and that still hasn’t happened with my geometry class. Sometimes it never happens. So, I was quite upset presenting. I didn’t really know what I was doing, everyone was staring at me, and I was seriously considering faking passing out. As soon as I finished–it seemed to go on forever–I actually fled the classroom and spent quite a while collecting myself in the bathroom. Hopefully this will not be a regular experience. Before speaking or engaging in any sort of non-solitary activity, I turn on a mental switch. This switch allows me to interact and gain maximum enjoyment. Without the switch, I’m disoriented and uncomfortable. So, before seminars and speaking opportunities, I’m able to collect my thoughts and turn on the switch. This switch can remain on for a period of time, which varies based on my mood or situation. After overuse, it automatically turns itself off. At this point, it’s like a computer overheat. I need to cool off. The switch returns to its quiet state, during which I can write, think, and pray. Conversely, leaving the switch on its quiet state for too long causes freezing conditions and restless dysfunction. At this point, it turns itself on. I digress. My point is that sometimes, the things we think we’ll never do end up coming to us. It just takes a little time, or perhaps an enlightening moment of confidence. 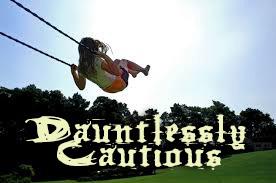 This entry was posted in Dauntlessly Cautious by Dauntlessly Cautious. Bookmark the permalink. I’m Abigail, a wildly emotional teenage blogger-empress. Sometimes I blog about my copious feelings. Sometimes–a lot, actually–I blog about my past. Sometimes it’s random and unexpected–romantic thoughts passing by, an odd dream I had, and so on. Oh yes, and I have a lot of opinions. Chances are you’ll disagree with at least one of them. I started blogging in April 2013, a little before my fourteenth birthday. Since then, I’ve published many posts–some groundbreaking and ingenious, some embarrassingly dismal. No matter their quality, however, they all play some sort of a part in my life story. If you’re in a stalking mood, read how my attitude changes from good to bad and back to better again. It’s all me. This is the mind of the odd, imaginative girl you see in the hallways, the cafeteria, and in classes. This is the heart of a human battlefield turned into a wonderful, scar-littered garden of hopes and dreams. Welcome to the two (or three, or four) sides of me–the daunting and the rash, the apprehensive and the careful.